One of the things for which Cross Rhythms radio stations are most often praised is the openness of our playlist policy. Where most stations limit the music they play to record company releases, Cross Rhythms is prepared to consider all independently released music which falls within our youth culture format. Not only that, but we also are open to audition any non-UK release from any part of the world. And that is how it came to pass that recently an unknown band from Switzerland, Volplane, found themselves at number one on the weekly Cross Rhythms chart. The swathes of Cross Rhythms listeners currently enjoying "A Thousand Colours" by Volplane will agree that it's one of the catchiest pieces of pop rock heard for awhile. Having played what is the group's first single (now available on iTunes in four different mixes) it was clearly time to go in search of the band to get their story. Volplane consist of Jonathan Mueller (guitar), Michael Ritter (keys), Samuel Schwalm (drums) and Toby Ferrari (lead singer, guitar). Their bass player, one Phillip, left the band in 2012 and the band are currently gigging with dep musicians while they look for a permanent replacement. Toby acted as the band's spokesman and gave a brief history of Volplane. "It all started with the band called Mole Affect in 2009 when Jonathan, Sam, Michael, Phillip and Felix started to do rock music together. Mole Affect recorded an EP with I think three or four songs on it. Then in 2011, lead singer Felix chose to leave the band, because it wasn't the sound he was very comfortable with. He's got a very good voice for soul music and that didn't fit into the rock music. When the rest knew that he was leaving they started looking for a new singer. I had recorded a solo EP and was one of the singers they contacted. When I got the message I said I would love to join the band and went to the auditioning. And they chose me after checking all singers. At that particular time we all had new goals on what we would like to do, what kind of music and what we would like to achieve. We started to write new music and were jamming a lot together. We arranged and wrote new music that was totally different to what Mole Affect did. And with that change (our goals, our music, our lineup) we also chose to change the name of our band. We were thinking about lots of names. But then Jonathan came up with the name Volplane. We all liked it because it was short and also because I think we were quite a bit sick of trying to come up with more names. Volplane means to glide. Flying without engines. I guess it's a word that comes from the language of aviation. It's not a word that's very common. We chose that name because we think we have very atmospheric sound." 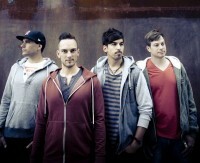 All the members of Volplane are Christians, but they are avowedly a mainstream band. Said Toby, "Our faith is very important to us in our personal lives. I would describe it this way: we know we've been given a gift. And we love to share it with all people. When I write the lyrics I'm telling stories. And there is room for the listener's imagination no matter his or her background. To me it's very important to have confidence in the lyrics and good values." Toby spoke about the Swiss rock music scene. "We do have quite a lot of festivals here in Switzerland such as open airs during summer time. And also every city has its own festival where they organize concerts. Also every city has clubs where bands can play. There is actually no lack of platforms to do music. The music industry in Switzerland is focused on the musicians who they know they can make money with. And this means they invest into musicians who sing in Swiss German. That's what works for them. And it makes sense to me. But also we have a few bands who sing in English that became popular but this is a rare thing. It's hard to be heard because there are so many bands. You must be really lucky to become popular. But we keep on dreaming and we were so surprised that we've made it to number one on the Cross Rhythms chart. I mean we're a young Swiss band with our first album 'Far Beyond Imagination' and struggling to be played on the radios here in Switzerland but at Cross Rhythms UK we're ranking number one in the charts! We feel honoured really." The best gig Volplane have played so far was at the Winterthurer Musikfestwochen. Said Toby, "It's a festival in our home town where they organize concerts during 12 days. They also invite bands that are famous. But for a local band from Winterthur such as we are it's an honour to play at this event. It's in the old part of the city. So we were playing on a huge stage in that old alley. It was awesome. A very, very good experience." Toby described "A Thousand Colours" as "a spring hymn." He continued, "It's about change. The cold weather is slowly going to fade and the sun is warming the days. In the first verse I describe that my perception has changed, I have been going through a process where I now finally see things differently. They are not anymore stained by certain experiences. Things are becoming good. It's about colours. It's about living freely. And as a result of that I'm able to 'rise up to the sky to touch the highest clouds and dance above a thousand colours'. Or in other words I am able to dream big. We arranged this song together as a band. Jonathan came up with an idea he had on his guitar. We checked it out and arranged the whole song. In the beginning I thought it would be difficult to write something because I actually didn't like the chorus part. I thought it was boring. But it turned out to be a very good radio song with a beautiful melody and lyrics that have deep content." Switzerland at Mazzive Sound Productions. We worked together with Christian Häni who was our producer. He also is a musician and is playing and singing in a Swiss band called Halunke. He is a very experienced guy and knows the Swiss music industry well. Before we decided to work with Christian we met different producers to find out who would be the man we would like to work with. We liked the philosophy of Mazzive Sound Productions because their service goes beyond just the recording part. They also offer to help arrange songs and also help bands to find a label. It's a full board studio. We chose to work with them since spring 2012 and we met a few times to organize the recording which we planned in December. Then in December we spent a whole month in the studio. As far I remember we didn't have any trouble during the recordings except for where we invited someone to add some backing vocals to make some songs more dynamic. But it turned out that his English was really bad and we could use almost nothing after a hard day in the studio." The new single from 'Far Beyond Imagination' is "Let The Game Start". Explained Toby, "It is a song about sport, describing the mental preparation of a team and building up confidence. A real fun song. This one is really cool to play live because people can easily sing with us during the chorus. Another track on the album, "Philosophize" is about the emotion to feel like a kid again. For kids everything is possible and they don't care about the circumstances. They are confident. To me this is very important as a young man that I still am allowed to dream. It would be sad if we let go of our dreams just because someone or some circumstance tells us they can't be. It's a lie! Be like a child every now and then." One spiritual lesson that Toby has learned in the last year or so is "to enjoy the process." He commented, "It's hard sometimes to live in a world where we would like to have everything just right now. And very often we can have things just in an instant. It's not good for the character. To me it's important to live every day to its fullest and being faithful in small things knowing that it's just fine to be exactly where I am today. Because if I do that I'm getting ready and prepared for the bigger things that will come. And I know if I didn't enjoy and go through that process I'd fail. How could I run if I never learned to walk?"